Have you heard of the Great Pumpkin Boat Race? People grow huge pumpkins, carve them out, climb in them and race them down a river. How fun! Well, this got me thinking. Why can’t our little dolls have that much fun also? Simply get a little pumpkin and slice off the top. Scoop out the seeds and some of the flesh (a lighter pumpkin floats better). The ‘boat will float like this, but why not make it into a little sail boat. Tape two sticks together and add a little paper sail (greaseproof paper will withstand the water well). Attach to the inside of the pumpkin with a little playdough. 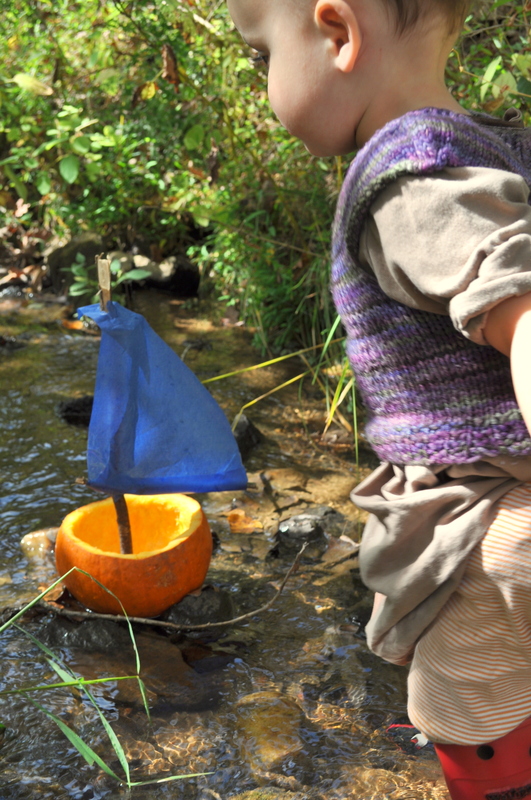 Find a river, creek, large puddle….or even a bathtub, put in some little dolls and set them off on an adventure! Grab some friends and have a pumpkin boat carving party, followed by a little boat race. The evenings are getting chilly and the leaves are changing. Pumpkins seem to be everywhere! Last week a friend of ours introduced us to these sweet little pumpkin birdfeeders. My daughters loved them so much that we had to make some more for our garden! Using a little pie pumpkin, slice off the top and set aside – you can bake this and use the flesh for cooking. 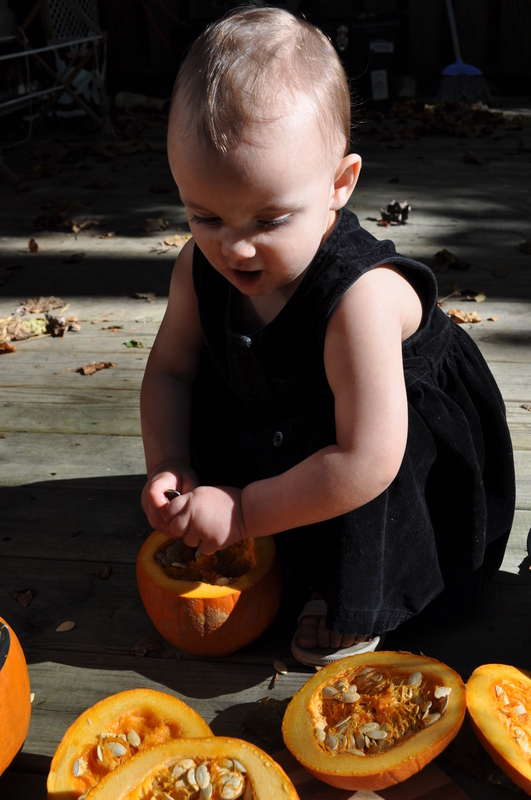 Give the kids some spoons and let them scoop the seed out of the pumpkin. These can also be saved and are delicious baked with a little oil and salt. Once you have cleaned out the pumpkin (you can leave most of the flesh), pierce a hole in one side and push a stick through. This is to create a little standing perch for the birds. Now fill the pumpkin with birdseed. 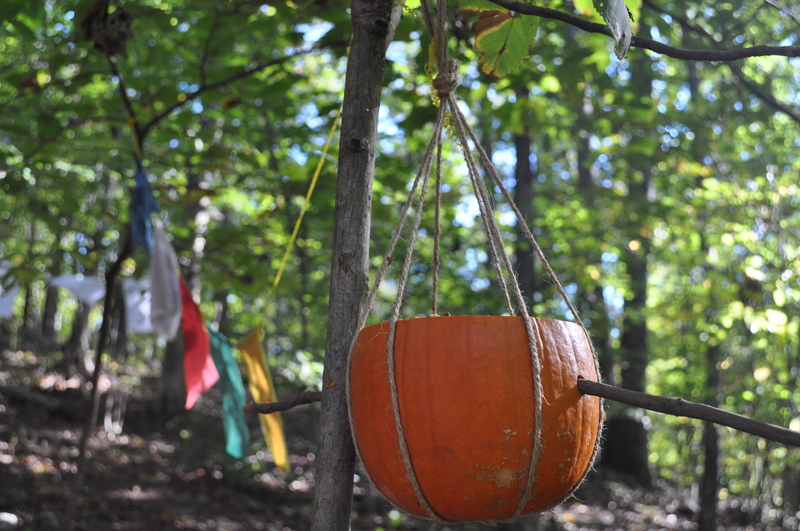 We hung the pumpkin with three long pieces of twine tied together at the middle an then spread around the base of the pumpkin. Tie again above the pumpkin and hang straight away. After a few days, as the pumpkin softens, you may find that the birds become less interested – but the squirrels may become more interested. If you know anyone with chickens, they will love the pumpkin treat when it it is too soft to hang anymore!